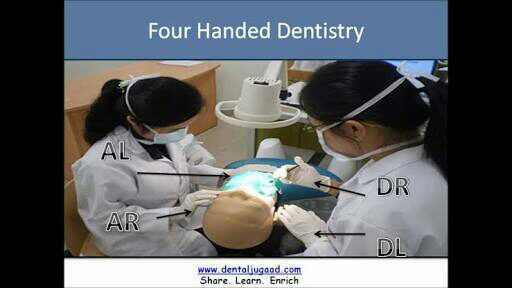 What are the Steps in Four-handed Dentistry? In four-handed dentistry the dental nurse/surgery technician provides close support for the dentist, sitting on the opposite side of the patient. The actual position depends upon the operative procedure being performed, and upon the dentist wishes. The surgery technician places all new instruments firmly into the dentist’s hands, ensuring that day are the correct way round for use. He/she takes away each instrument after it has been used. It is therefore important for the dental nurse/surgery technician to have all instrument laid out in patients so that they are in reach to ensure the speedy and efficient, care of latter is not held up whilst, for example, a dental nurse searching for a matrix holder. He/she must ensure that the correct rotating instrument is in the handpieces. The cavity is washed and aspirated to ensure that the site of operation it’s clean. Lips and check are retracted so that the dentist can see what he is doing. After the operation, a dental nurse should give post-operative instructions. Doors to the surgery must be kept closed. Drawers and cupboards in the surgery should be closed immediately after use. Tidiness is indicative of efficiency. Cupboards and drawers should be kept clean by lining with self-adhesive materials, which can be wiped with a damp cloth lining should be removed periodically. Records, charts, radiograph, models, and photographs relating to the patient should be at hand. It should be presented in front of a dentist before a patient enters the surgery. When the patient enters there should be no signs of instruments or materialized on the previous patient. The bracket table, cuspidor, headrest, end of spray bottles, air syringes and handpieces should be cleaned after each patient. Fresh and clean saliva electors and mouthwash beaker are essential. Patients often complain that everyone seems to use the same beaker. Thus the disposable variety is appreciated. If the dental nurse makes a good impression with this minor details the practice we get a good reputation for its standards observant, patient watch out for quite ordinary details and can be very critical or what is seen. Seat the patient in the chair, with back and headrests adjusted correctly. The backrest top should be in line with the lower part of the shoulder blades. The headrest should be in line with the base of the skull so that the head is in line with the rest of the body. If superposition is to be used, give the patient some ideal of how the chart will be adjusted. So that no alarm is caused. If the dentist and the technician are to site either side of the patient, this should be explained to the patient to keep in mind throughout any preparation so that they know what is to take place and what is expected of them. Place a clean napkin on the patient neck. Ensure that all instruments required for the operation are at hand, either on bracket table, trolley, or tray as desired by the dentist. Be aware of the dentist’s routine with all his work so that every need can be anticipated and met. He should not have to ask for equipment. A well trained dental nurse has everything in readiness. He/she must, therefore, be familiar with the operation to be performed, the instrument and material to be used, and how to prepare them. In many busy practices, one of the team is constantly on the chair side giving necessary assistance, while another assistant is responsible for the materials, processing radiographs, and fetching and carrying instrument when required. Talking and noise of any kind are kept to a minimum during operative procedures. The assistant who is acting as helper should constantly clear aways used instrument and soiled materials and should prepare the former for sterilization. The use of dental materials is most important and these should be well understood and used correctly. Dental material is expensive to purchase. If the directions for use are not adhered to, a material will often be wasted and, more important, the dentist’s work we are ruined. It is a good practice to keep a folder of all printed instruction so that they can be referred to when needed. The small amount of time spent on reading this article saves much frustration, time, and money.